The U.S. Armed Forces, comprised of the Air Force, Army, Coast Guard, Marine Corps, and Navy, is recognized as the most powerful fighting force in the world. Under the authority of the Department of Defense (DoD), our armed forces faithfully carry out their duties in war and peace times to keep our country secure. Our national defense depends not only on the bravery and expertise of the men and women serving in and supporting our Armed Forces, but also on mission-critical equipment. Unfortunately, critical defense systems can become compromised through the integration of counterfeit parts. These faulty parts can disrupt DoD supply chains, delay ongoing missions, and compromise weapons systems. All branches of the Armed Forces are affected by this serious issue. What Does Counterfeit Mean, and What Are Counterfeit Parts? If you buy a designer watch for a small fraction of the retail price, you know what you’re getting: a cheap knockoff made to look like the real thing. That is one of the typical ways you might encounter a counterfeit item. But what if you bought the watch for the retail price straight from the designer only to find out it was made from poor-quality materials? This scenario would certainly be frustrating and unfair, but the consequences wouldn’t be dire. Unfortunately, the Armed Forces frequently encounter a similar scenario but with far more serious consequences. 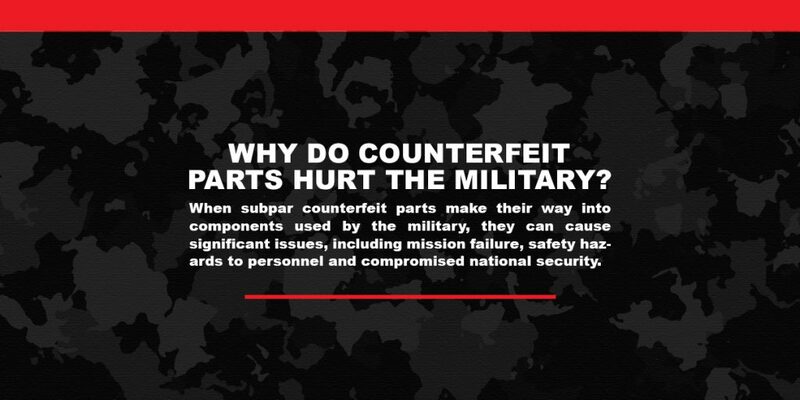 Counterfeit parts are typically either salvaged or made from subpar materials even though they are marketed as meeting the standards of quality the military expects from a manufacturer. In some cases, products are sold by counterfeiters pretending to be an official retailer associated with a brand. In other cases, the manufacturer itself may accidentally or intentionally allow counterfeit parts to be built into their products. Used electronic parts may be represented as new or grade identifications, lot numbers, serial numbers, date codes, or performance characteristics may be falsified. Re-marking a used product to pass it off as a product with a higher grade is an especially popular form of counterfeiting. It can be nearly impossible to tell in some cases whether parts are made from quality or counterfeit materials, even for the manufacturer. Part of the problem comes from the fact that manufacturing has expanded into a highly globalized industry. Many companies no longer keep all their operations in-house. Instead, they rely on other companies and overseas manufacturers to play a part in assembling their product. Overwhelmingly, counterfeit parts originate in China before entering into the supply chain. No matter how they get into circulation, though, counterfeit parts pose a serious threat to the Armed Forces. Why Do Counterfeit Parts Hurt the Military? When subpar counterfeit parts make their way into components used by the military, they can cause significant issues, including mission failure, safety hazards to personnel, and compromised national security. Counterfeits can show up almost anywhere — it could be a fastener used on aircraft or materials used in engine mounts, but the more prominent issue for the military is counterfeit electronic parts. These parts can appear at any level: system, sub-system, component, or sub-component. A Senate Armed Services Committee investigation in 2012 uncovered dozens of examples of electronic parts in critical military systems that were suspected to be counterfeit, including parts used in a large quantity of military aircraft, in thermal weapons sights for the Army and in mission computers for the Missile Defense Agency’s Terminal High Altitude Area Defense (THAAD) missile. The investigation found over a million total suspected counterfeit electronic parts in the U.S. defense supply chain. This number is so high in part because electronic counterfeit parts can be especially difficult to detect. They can also be very problematic. Even the tiniest electronic components can make or break the effectiveness of a much larger piece of equipment. Electronic devices consist of circuit boards that comprise of passive and active components as well as integrated circuits. A counterfeit part could be present at any of these levels. Counterfeit microchips have been found to be especially rampant in military systems. For example, counterfeit microchips have shown up in replacement parts for missile guidance and satellite systems. When any type of counterfeit part, including electronic parts, renders an important piece of equipment ineffective, it can result in failed missions and even loss of life. What Makes Electronic Counterfeit Parts Especially Dangerous? According to the Defense Federal Acquisition Regulation Supplement (DFARS), means an unlawful or unauthorized reproduction, substitution, or alteration that has been knowingly mismarked, misidentified, or otherwise misrepresented to be an authentic, unmodified electronic part from the original manufacturer, or a source with the express written authority of the original manufacturer or current design activity, including an authorized aftermarket manufacturer. While all counterfeit parts can cause problems to some degree, electronic counterfeit parts pose a particularly serious threat for the Armed Services. For one, as more and more equipment is built to rely on electronic capabilities rather than analog technology, the integrity of electronic parts is critical. In addition to the issues caused when a piece of equipment breaks down due to counterfeit electronic parts, another issue is that these counterfeit parts can pose a threat to national security. Many counterfeiters are only concerned with making money, but others may have a more sinister goal. Counterfeit electronic parts can be used for harmful purposes, such as intercepting classified information or disabling weapons systems. All it takes is for the counterfeiter to hardwire these capabilities into the parts without the Armed Forces or the manufacturer knowing. Counterfeiters with malicious intent can be very crafty in their execution, so their parts appear identical to and function just like the parts from the original manufacturer. Therefore, standard inspection and testing protocols are unlikely to detect this malicious functionality built into components. How Is the Military Responding to the Counterfeiting Problem? No one is more aware of the gravity of the threat posed by counterfeit parts than the DoD. In 2011, the military estimated that possibly 15 percent of all of its replacement parts for weapons, vehicles, and other equipment were counterfeit. Reports like this one reveal a serious problem with counterfeit parts infiltrating a variety of military systems across all branches. In the same year, Former President Barack Obama signed the National Defense Authorization Act, which placed a high priority on developing solutions to the counterfeit parts problem. For over a decade now, the DoD’s Trusted Foundry program has worked to secure the manufacturing infrastructure of electronics across multiple microelectronic suppliers. However, counterfeiters are still managing to infiltrate the supply chain. In recent years, the DoD’s efforts have become even more concentrated on finding innovative ways to work toward counterfeit parts prevention. The Pentagon is bent on developing and implementing countermeasures to ensure the effectiveness of our military, the safety of its personnel, and the integrity of our national security. An example of one of these countermeasures is the DoD’s experimentation with using plant DNA to forensically brand all electronic parts in the supply chain. The plant DNA is suspended in epoxy ink and is cured to ensure it remains detectable. Other examples can be found in the efforts of the Supply Chain Hardware for Electronics Defense (SHIELD) program. As part of this program, the Defense Advanced Research Projects Agency (DARPA) is actively working to develop a way around counterfeit microchips. This is an especially important problem to address since integrated circuits play such a central role in the military’s technology, and this is where counterfeits have shown up the most. The potential solution lies in microscopic identification tags called “dielets” or “chiplets” that would be implanted by authorized chipmakers only during assembly. This technology would allow the DoD to beat counterfeiters at their own game by using the discreet dielets as identification tags and as a means to verify whether a circuit board containing the dielet-equipped microchip has been altered at all by counterfeiters. The Pentagon plans to begin inserting the dielet tags into a test supply chain by 2019 to see how effective they are. What Can We Do to Aid in the Fight Against Counterfeit Parts? The military’s fight against counterfeit parts is ongoing. Fortunately, after years of limited funding, President Trump signed a bill this year that includes a $160 billion boost in defense spending over the next two years. This means the military’s budget for 2019 will equip them to double down on counterfeit prevention even more. Solving the counterfeit parts problem should remain a high priority for the military next year and in the future, until it no longer poses a threat. Awareness of the issue is an important first step. When you know just how pervasive the problem is, you know to watch out for it. Individual buyers should remain vigilant as they purchase electronic components. Don’t be fooled by what seems like a good bargain. Be sure to check the seller’s credentials, especially if the price is much lower than it should be. As the old adage goes, if it seems too good to be true, then it probably is. You may save money initially when you buy a counterfeit product, but it could cost you in the long run. The better strategy is to purchase electronic parts from a company you trust to deliver high-quality products. 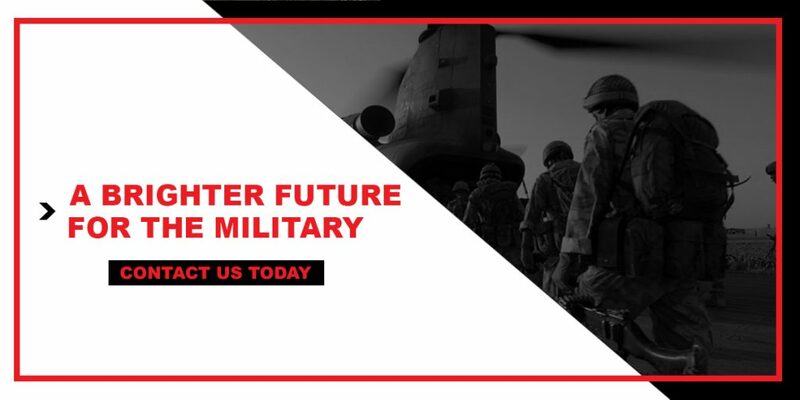 At Advanced Conversion Technology (ACT), we stay up-to-date with the latest military standards, as well as the most innovative designs, materials, and methods of manufacturing to produce superior power supply solutions. 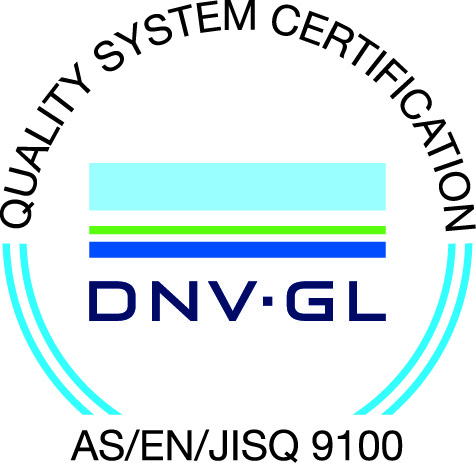 We take all necessary measures to ensure our products deliver on quality. Our quality management system is extremely thorough, and our supplier policies are exceptionally strict to make sure no counterfeit materials make their way into our products. Out of the many facilities in the U.S., our facility in Middletown, PA is one of the few that can produce power supplies that meet the requirements of MIL-S-901, MIL-STD-810, and MIL-STD-461. We are able to ensure the quality of our products because of our vertically-integrated manufacturing facility, which allows us to remain in control of all aspects of the manufacturing process. We stay vigilant against counterfeit parts by following our strict guidelines. This protects our products and anyone who uses them from suffering any kind of loss due to a faulty part. Counterfeit parts are everywhere — not just in the military, but also in products American consumers buy and use every day. It may be a knockoff designer watch, a handbag, or an electronic device that contains a counterfeit microchip. For the American Armed Forces, the stakes are especially high, and counterfeit parts can have a dire effect on mission-critical equipment. Though the issue of counterfeit parts presents a real obstacle to our Armed Forces, just as with other threats to our nation’s security, the U.S. military can be counted on to combat this challenge strategically and forcefully. As funding pours into the DoD and as we continue to learn more about the sources of the counterfeit problem and how to eliminate it, counterfeiters will no longer have the power they do today. This bright future will only be possible, though, if we remain vigilant and continue to fight back. Here at ACT, we share the DoD’s mission to combat counterfeiting. If you want to learn more about how ACT can help, contact us today. We are here to ensure your power supplies are of the highest quality and are uncompromised by counterfeits. We’re doing our part to fight counterfeiting by producing products that are affordable and reliable.